Any violinist who has ever googled audition advice on orchestral excerpts, has undoubtedly watched Nathan Cole's tutorials on orchestral auditions. Nathan Cole, First Associate Concertmaster of the LA Phil, truly is a marvelous artist and educator. He has performed with most major orchestras in the US, including Pittsburgh, Minnesota, Houston, Ottawa, Seattle, and Oregon Symphony orchestras. Prior to LA Phil, Nathan was a member of the Chicago Symphony and Principal Second Violin of the Saint Paul Chamber Orchestra. In addition to teaching both at Colburn, USC and Azusa Pacific University, Nate maintains an active blog, www.natesviolin.com, in which he blogs about his musical experiences, and offers free tutorials on orchestral excerpts. 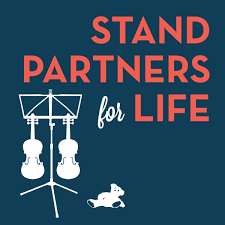 He recently started a podcast with his wife Akiko Taramuto (Assistant Concertmaster for the LAPhil) called "Stand Partners for Life, which offers a weekly “inside look” at the symphony life. In our interview, I asked him questions about the future of music, but also questions pertaining to the LA Phil, and how it has become a musical hallmark of Los Angeles. LS: What direction do you see classical music taking in the next twenty years with respect to the symphony as a musical institution? What direction should it be taking? NC: I do see groups embracing more and more living music. That’s been happening for a while with the biggest institutions. I see that happening not just in the big budget institutions but in the smaller ones too. I see some organizations failing to make it if they don’t change. The orchestras that fail to look ahead and fail to see where their support is coming from I don’t think will survive in the coming years. We already know that support is not going to come from public money. I see that in the creation of a lot more new work and the continuation of blending audio, visual, and acoustic elements. My hope is that symphonies will become more local, that is, more tied to the communities they serve. It seems that for a long time the hope of the symphony has been to resemble the biggest groups--Chicago Symphony, L.A Philharmonic, New York Philharmonic--no matter where they were. What I hope is that we can get to a place where each symphony’s audience expects to go to concerts, and experience something they can only get in their home town. It would be something more akin to a sports experience where you go not just for the game but for the arena, ballpark, the vibe of the crowd that’s there. You know who the players are, and what their tendencies are, and you know how they’re going to react to their opponents. Now, we don’t exactly have opponents in the symphony orchestra but a particular orchestra with a particular piece could be akin to one team playing another. That would extend to the kinds of pieces that orchestras play. Not all orchestras have to play the same pieces. Orchestras should play to their strengths and understand what their audience loves. Maybe that means that the biggest orchestras have the biggest flexibility, but I think that’s only natural. What I want to get away from is a small orchestra only wanting to play the same pieces as a large orchestra, and trying to deliver the same exact experience as the Chicago Symphony or LA Phil. Not because the players of both respective demographics are different but because the communities themselves are different. LS: How has the LA Phil sought to become more tied to the LA community? NC: There’s a big connection with the visual arts and with contemporary music in LA. They promote a lot of new music that is constantly being created. Strands such as visual arts (which extend to lighting and sculpture), mixed media and constant creation of new music and film are hallmarks of LA. The LA Phil is constantly presenting projects that weave things together. LA has the luxury of not having to recoup every investment in the projects they make. They raise money to take shots at various projects that may or may not bear fruit. And I think that is the responsibility of a leading organization like the LA Phil---to take those risks and to show what is musically possible. I’m proud that we have an organization like that, which chooses to habitually take those risks. LS: What role does collaboration take in the future of classical music? Any examples of this currently at the forefront of the arts scene? NC: I see interdisciplinary collaboration becoming more frequent, but I also hope it’s more careful. I think when those collaborations are undertaken for the sake of mixing them, sometimes it can appear mismatched, ie: placing dancers in the middle of the orchestra. So the direction I hope it takes is cohesive, not cobbled together. I should say too, that I hope the symphony continues to embrace the music of our time in all different styles, and so that we get back to new music being exciting and listenable. I’m not saying that every piece has to have a singable tune but in general the idea of a symphony playing new music should be exciting and listenable. LS: What role do new music and new composers have in the future of classical music? NC: From my perspective as a player in the symphony, I think their role is to build an audience for their work. It would serve them and us as well. It used to be that we thought “Beethoven would be the gateway to show the audience new material.” However, I suspect it will end up being the other way around. There will always be and there should always be people who are passionate to hear masters of the past, but people who are alive are the ones who can work at building an audience. LS: What has been the public reaction and or your experience of planting classical music in non-conventional venues? NC: My biggest experience of that is running a chamber music festival in Lexington, Kentucky. We’ve had few of those concerts which have been highlights for us as players. I like to combine classical concerts with food and drink because your audience is giving you their time, and usually a fun evening out includes eating and drinking. Regarding the chamber music festival, we’ve also had success with shorter musical selections in concerts. In our festival venues, quality amplification is hugely important. Much of the music people generally enjoy listening to, is usually in different venues besides the concert hall. So, when done well, amplification is a great tool. LS: What steps should millennials be taking now to keep interest for classical music alive? NC: It’s hard to tell people what they should be doing. As someone who is a performing artist, I really want people to keep creating art. If you are a performer on an instrument, keep playing for groups large and small. Look to create something and if you need help with that, find a band leader or composer, to be a part of that creation process with you, because that collaboration is what is going to drive big and small institutions of art. The biggest thing millennials can do to keep classical music alive is to create new work and be involved in its performance. LS: Do you think the Arts will exist into the 22nd century? NC: I do. Humans crave art, we need it. We may be going through a dip right now in public perception because of what’s dominated the news lately. But some of those scary times are the ones that give birth to creative works as well. As long as people keep making it, art will survive. LS: What is the best advice you bestow to young musicians? NC: To be aware of what your message is to the audience, and not be locked forever inside your own head and inside the practice room. There are times in life where you have to buckle down and practice. If you’re a classical musician, that’s a lot of your life. While there’s no escaping the hard work, always keep in mind who it’s for and why you’re doing music. At the end of the day, you play music for the love of music and those you love. If you forget about that for too long, you’ll wither away.